TADHack-mini Orlando: And We're Off to the Races! TADHack-mini Orlando, taking place coincident with Enterprise Connect, is heading into the final stretch. 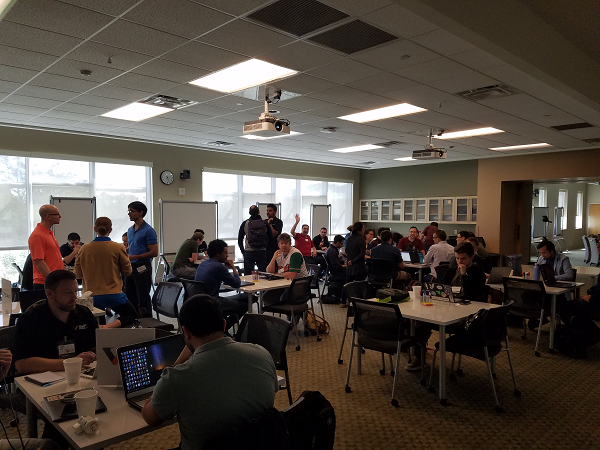 TADHack-mini Orlando 2018 kicked off Saturday morning, drawing some 140 registrants, roughly 68 of whom showed up to participate in person at Valencia College, with another batch hacking remotely, overseas from countries the likes of Belgium, Russia, Turkey, and others. Organizer Alan Quayle kicked the day off with a short talk about the goal of TADHacks, that being to take advantage of the democratization of telecom to solve real-world problems. After a quick introduction, each sponsor gave a short presentation to the participating developers, sharing information about their APIs and what they can be used for as well as other resources to help developers in their efforts this weekend. While many developers will use their own creative whims to determine what applications they will develop this weekend, others might follow the guidance of sponsors -- Avaya, Flowroute, Telnyx, and VoIP Innovations. For example, VoIP Innovations, which acquired French API company Apidaze in late 2017, offered a couple of challenges to developers. One challenge is to build a conference bridge with a Web interface that indicates who is talking via real-time audio transcription. The second challenge is to build an in-call virtual assistant that allows callers to ask it questions like what's the weather in a particular city and receive a voice response. 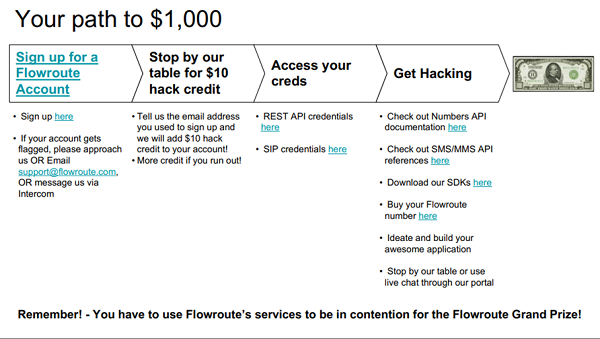 Another sponsor, Flowroute, gave developers a path toward success, as shown in the below slide from their presentation. The hackers worked overnight on their applications, continuing as I write to wrap up so they can present their finished hacks to sponsor judges later this afternoon. After deliberating, sponsors will select winners, issue prizes... and the celebrations will commence. You can watch the hackathon and winner presentations via live stream here. Not only will the winners walk away with some well-deserved cash, but winning developers will have the opportunity to show their applications to the Enterprise Connect audience in the Monday afternoon session, "Hackathon Spotlight: Programmable Communications is for Everyone," scheduled for 3:15 p.m. in Osceola B. And tune back in to No Jitter for more coverage on the winning hacks!